Large amounts of data, a variety of sources, high speed production, but also high speed processing – these are the basic characteristics of Big Data. The amount of data that is generated and collected in each second grows exponentially. The management of Big Data, the intelligent use of large, heterogeneous data sets, is becoming increasingly important for competition. It is affecting all sectors – industry and academia but also the public sector. While the economy is exploring Big Data as a new gold mine, politicians are fighting over the problem of data capitalism, whereas science tackles the question of cross-disciplinary benefits, as well as on the challenges and the likely consequences for technology, innovation, and society. I will contribute a poster focusing on some of my dissertation’s findings on the use of Twitter in the analysis of social and political phenomena. More on that topic later this year once the dissertation is published. 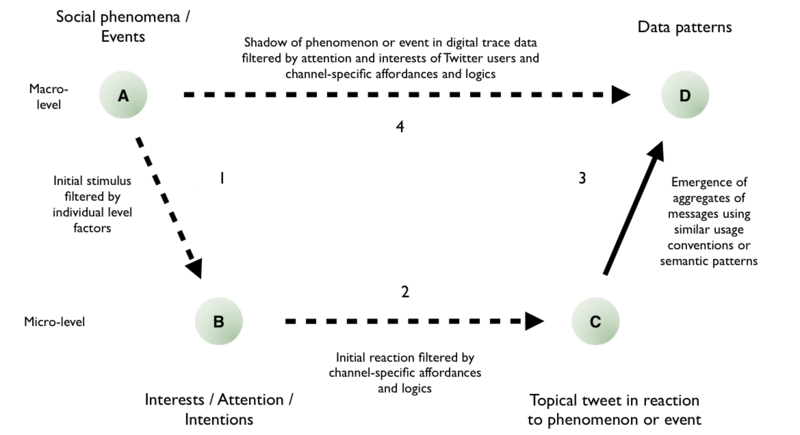 Most research using digital trace data in the analysis of social phenomena implicitly assumes these data to provide true mirrors to phenomena of interest (mirror hypothesis). Given specific data generating processes producing the data used in these analyses, this hypothesis seems highly unlikely. Instead, it is far more likely that these data offer a skewed reflection of social phenomena mediated through interests, attention, and intentions of users and service-specific affordances (mediation hypothesis). This can be illustrated by the analysis of political phenomena with digital trace data collected on the microblogging service Twitter. Traces of political phenomena in Twitter data are produced in a multi-step mediation process. Based on an underlying political or social phenomenon (A) a stimulus emerges (such as an event) which has to grab the attention of a Twitter user for her to consider referring to politics in a tweet (B). Following this, users have to encode their initial responses to elements of political reality within the technological limitations of the microblogging service to create a digital artifact, tweet (C). These can in turn be aggregated (D). Based on these aggregates, various metrics can be calculated (e.g. mention counts of political actors or the structure of networks based on their interactions), potentially allowing inferences on the political phenomena giving rise to the data (4). The relationship between tweets and political reality is thus filtered by various mediating steps, potentially introducing various biases leading the picture of political reality emerging from aggregates of tweets to be blurred or skewed. Three types of influences are likely to affect this mediation process. Some are based on characteristics of events in political reality (1), some on the individual characteristics of users (2), and some on the specific technological design of Twitter and respective usage conventions (3). These mediating factors have to be examined much more closely to understand which parts of political reality are likely to be emphasized by this process and which are likely to be neglected. Political reality as found in aggregates of Twitter messages diverges from political reality in general. This is true for political events, popular topics of discussion, and attention towards political actors. This suggests some caution in expecting Twitter data to provide a true image of political phenomena. Instead, digital trace data appear to provide a selection of political reality determined by various mediation processes associated with the use of various digital services. Put differently, we have to take the dynamics and mechanisms of mediation of political reality through digital services seriously if we want to use digital trace data in the analysis of political and social phenomena. Jungherr, A. (2015). Analyzing Political Communication with Digital Trace Data: The Role of Twitter Messages in Social Science Research. Springer, Heidelberg. In Press.